At the school, students will learn how to maneuver Mister “P”’s signature red and yellow semis by sitting in the driver’s seat, but also by sitting down for classes in a 15,000-square foot building that will include a meeting area, classrooms and two loading bays for drivers to pull into. Mister “P” Express is pouring $5 million into the project, which is an expansion of a driving school that the company started in 2006. With its new facility, the trucking company will be able to increase its number of students from 20 to 25 at a time to over 100. Mister “P”’s investment is big because the need is big. Mister “P” Express and other trucking companies across the United States are expected to face a shortage of 63,000 drivers this year, according to a 2017 report from American Trucking Associations, with a need to hire almost 900,000 more over the next decade. David Summitt, the owner of Summitt Trucking in Clarksville, also knows what it’s like to be hurting for drivers. “It’s our number one problem,” he said. There are several trucking companies in the Southern Indiana area, and if Summitt is to be believed, all are suffering from a lack of drivers. ATA lists multiple reasons for the driver shortage: truck drivers are aging and retiring, women aren’t as interested in the industry, there are more enticing jobs available and regulations turn drivers off. Last year, the federal government began requiring trucks to carry an electronic logging device instead of paper logs. But there are other reasons why untrained workers aren’t keen on the idea of becoming truck drivers. Michael Belzer, a professor of economics at Wayne State University in Detroit who has been studying the trucking industry for at least 24 years, says the reality is truck driving doesn’t pay enough. When Summitt was a kid, truck driving was seen as a prestigious job. Today, that’s not the case, he said. As other jobs have seen pay raises, Summitt has seen the income for truck drivers remain stagnant. Drivers get paid for how long they drive, and the standard rate is currently around 40 cents per mile, Belzer said. 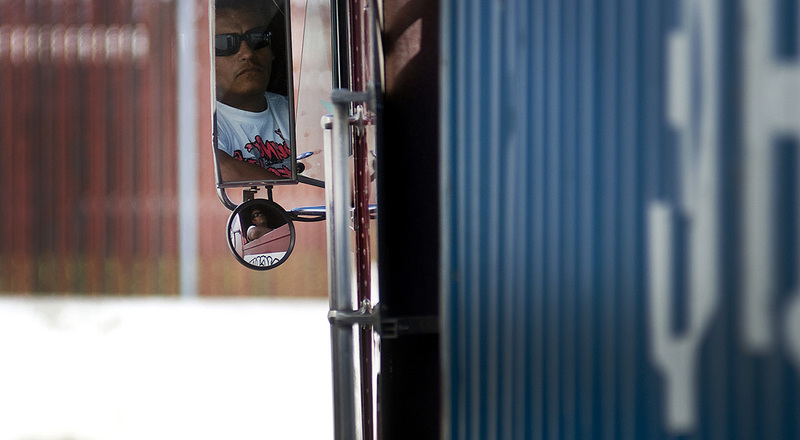 According to the Bureau of Labor Statistics, the median pay for a truck driver is $42,480 per year. But it’s the time that truck drivers don’t spend driving that is the problem. About 25% of the time truck drivers are “laboring,” they’re not driving, according to Belzer. Those hours are spent loading and unloading, waiting to be dispatched and waiting for the next run. That time in limbo leads to drivers quitting. Last year, turnover in the trucking industry among over-the-road drivers was 90%, according to ATA. “Once [truck drivers] realize that they’re working 80 to 100 hours a week, not the legal limit of 60, they’ll be a lot less enthused, especially when they realize the extra 20 to 30 hours that they’re working are unpaid,” Belzer said. Plus, truck drivers are often away from home for long periods, which is a deal-breaker for many workers. The work isn’t all bad. Truck driving jobs still pay more than the average position in the United States, and their workers get to see the country, said Collier. One of Mr. “P”’s employees, Jacob Long, said that he enjoys his current truck driving career more than he did working in the restaurant industry for 40 years. But Belzer’s solution for long-term employment success for trucking companies is to pay truck drivers more. And that’s already happening — in Southern Indiana, at least. Since December, Summitt said he’s raised his driver’s pay and benefits by 15% to 20%. At Mr. “P” Express, driver income ranges from $50,000 to $125,000. Trucking companies have pivoted to other solutions, too. Both Summitt Trucking and Mr. “P” Express try to keep their drivers on the road for only five days at a time so that their employees get to enjoy a weekend. Summitt also has hired more recruiters and even a nurse practitioner who treats his truckers and their families for free. And then there are the truck driving schools. About 70% of Mr. “P” Express’ drivers come from their school, according to Collier. Without it, she doesn’t think her company would have been able to take on the workload it has now. If the school attracts the 100 or so people that it’s built for when it opens this fall, Mr. “P” Express could increase its trucking capacity by 40 to 45%, said Glenn Metten, the chief financial officer for the company. Summitt has started his own driving school in Brooks, Ky. Recently, he received approval from the local government to build an overnight-stay building for his students that are from out of town. Belzer is skeptical of the driving schools and the nurse practitioners — the shiny benefits that trucking companies have promised their workers. And he still doesn’t believe truckers are being paid enough. It’s not the trucking companies that are fault either, Belzer said — it’s the suppliers. If the suppliers allow trucking companies to raise rates, the companies will be able to pay their workers more. That, according to Belzer, is the real solution. Summitt supports that. In his opinion, truck drivers should be paid $100,000 a year — a salary befitting the hero status they used to have.